For Edgar Garcia-Rill, Ph.D., successful leadership of the Center for Translational Neuroscience includes his many honors for mentorship of early-career researchers. April 2, 2019 | After 50 years as a biomedical researcher, Edgar Garcia-Rill, Ph.D., is close to hanging up his lab coat. When he does, he’ll look back on the last 15 years as the most rewarding of his distinguished career. “It will be like retiring after winning the Super Bowl,” said the UAMS professor in the Department of Neurobiology & Developmental Sciences. Fifteen years ago is when Garcia-Rill secured UAMS’ first Center of Biomedical Research Excellence (COBRE) award and established the Center for Translational Neuroscience (CTN). Funded by the National Institutes of Health (NIH), National Institute of General Medical Sciences, the expiring COBRE has been awarded $21,650,223 for investigator support and research infrastructure to UAMS researchers, including those based at Arkansas Children’s Research Institute. But what gets Garcia-Rill truly excited is the 6-to-1 return on the COBRE investment and having grown new, independent researchers, with programs and centers that will continue for many years to come. In its final report, the External Advisory Committee for the COBRE writes glowingly about the CTN under Garcia-Rill’s leadership. It notes the CTN’s support of 36 researchers who have reaped more than $120 million in funding from outside of UAMS. The committee’s members are: R. Eugene Anderson, M.D., Ph.D., from the University of Oklahoma; J. Scott Richards, Ph.D., the University of Alabama; Charles Hollingsworth, Dr.P.H., now retired from NIH; and Scott R. Whittemore, Ph.D., University of Louisville. Garcia-Rill said a key to the CTN’s early success was having the only COBRE at UAMS. With the CTN offering grants of up to $250,000 per year, it attracted the best early-career researchers from UAMS and Arkansas Children’s Research Institute. Once the mentoring program got going, he would meet regularly with the researchers and their mentors to ensure their career development was proceeding apace. “We managed to succeed very nicely,” he said. One researcher who benefited from the CTN is UAMS’ Michael Mancino, M.D., who said he will always be grateful for its support. Mancino said the grant also allowed time for authoring publications that otherwise would not have been possible. This eventually led to an R01 NIH grant to study improving outcomes in prescription opioid use disorders. Mancino is co-principal investigator on the study with his mentor, Alison Oliveto, Ph.D., professor and vice chair for Research in the Department of Psychiatry. UAMS and Arkansas Children’s Research Institute have five COBREs and Garcia-Rill is on each of their internal advisory committees. He was an advocate for pursuing the additional COBRES, and he hopes more will follow when the time comes. Although states are limited to five COBRES, Garcia-Rill notes that when a COBRE is 10 years old and entering its third and final phase, it opens a slot for a new COBRE. That means UAMS could apply for one to replace the CTN, and another in three years, when the Center for Microbial Pathogenesis and Host Inflammatory Responses COBRE enters its final phase. 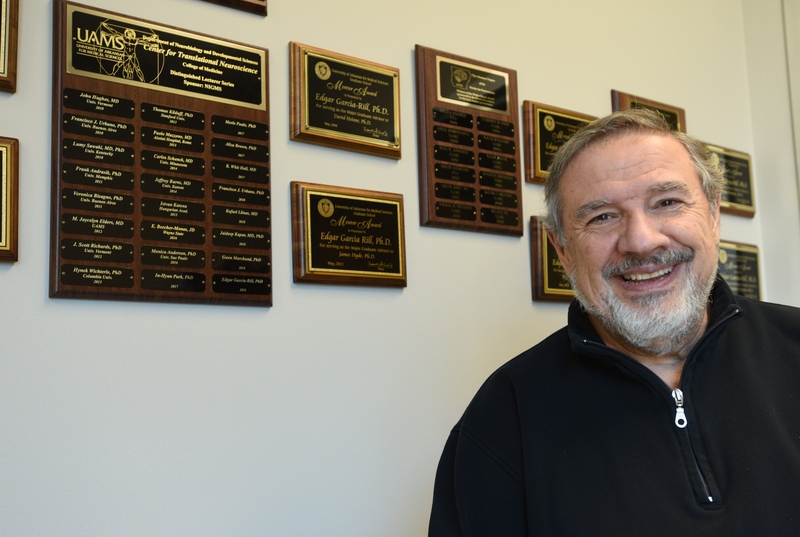 The EAC report notes that UAMS’ William Fantegrossi, Ph.D., who is among the most successful CTN-supported basic science researchers, is planning to apply for a COBRE. Fantegrossi, an associate professor in the Department of Pharmacology and Toxicology, College of Medicine, became the Behavioral Core director and an independently funded researcher. Among the final report’s highlighted achievements is the significantly reduced infant mortality rate thanks to the CTN’s Telemedicine Core Facility. Led by Whit Hall, M.D, its educational and consultation program for rural hospital nurseries, called PedsPLACE, has saved about 60 babies per year since 2009. As a result, Arkansas Medicaid will fund the program in perpetuity. Hall, a professor in the Department of Pediatrics, College of Medicine, is applying for an NIH grant to support an expansion of PedsPLACE in Mississippi. With his CTN phasing out, some of its infrastructure will be transitioned to a Neurobiology Center that’s being established by Gwen Childs, Ph.D., professor and chair of the Department of Neurobiology and Developmental Sciences, College of Medicine, and Angus MacNicol, Ph.D., also a professor in that department. Garcia-Rill will remain at UAMS through next spring, then pursue his other passion – writing. His third book, on neurological and psychiatric diseases, will be published this summer. He’s also drafted a book of fiction, the first in a trilogy based loosely on his family history.